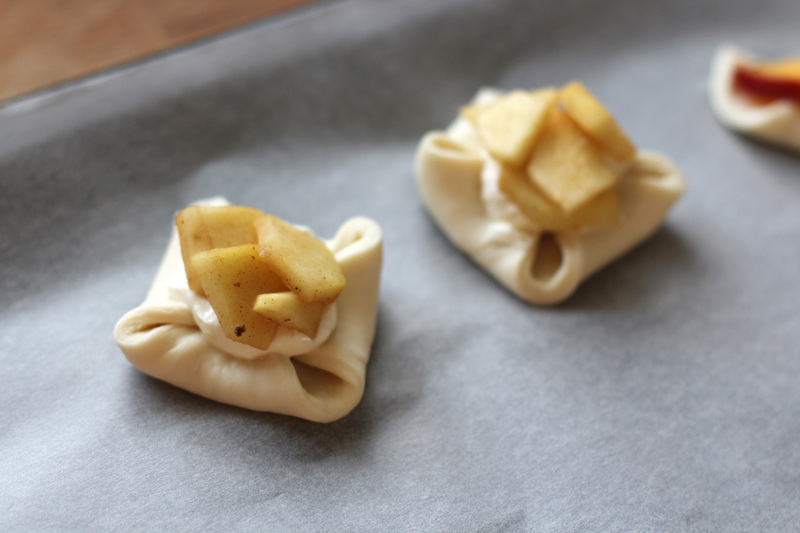 The other day I still had some apples from our tree and I was slowly running out of ideas what to make with them. There are only so many apple pies you can bake, you know? So I thought I’d try something new and then I found ready-made dough for Danish pastry. I had no recipe so I just grabbed random ingredients which I thought could taste nice and oh my God, they did. Okay, so since I didn’t have a recipe for this and did most by taste this is what you’ll have to do as well. Pre-heat the oven to the temperature needed for the dough. Peel and cut one apple in small slices. I added lemon juice, honey and cinnamon for taste and cooked it for a few minutes. Take care that the fruit doesn’t get too soft. 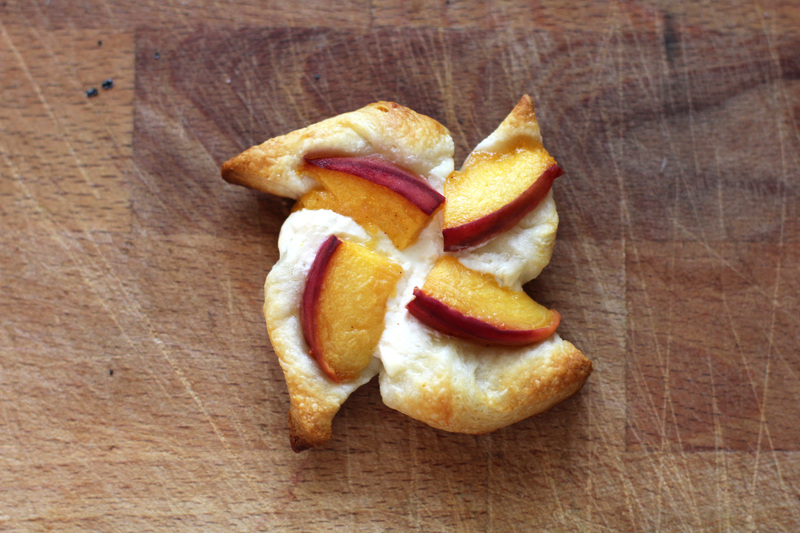 Then I did pretty much the same with the peaches, but left out the cinnamon. Mix together the curd cheese and some of the vanilla yoghurt (again, just as much as you think tastes nice). Add vanilla extract (syrup or whatever else you have). Add sugar if you want to (I didn’t. Mostly because I’m trying to reduce my intake of sugar when it’s not absolutely necessary, like in coffee or tea :)). Cut and fold the dough. I found this tutorial and it worked really well! 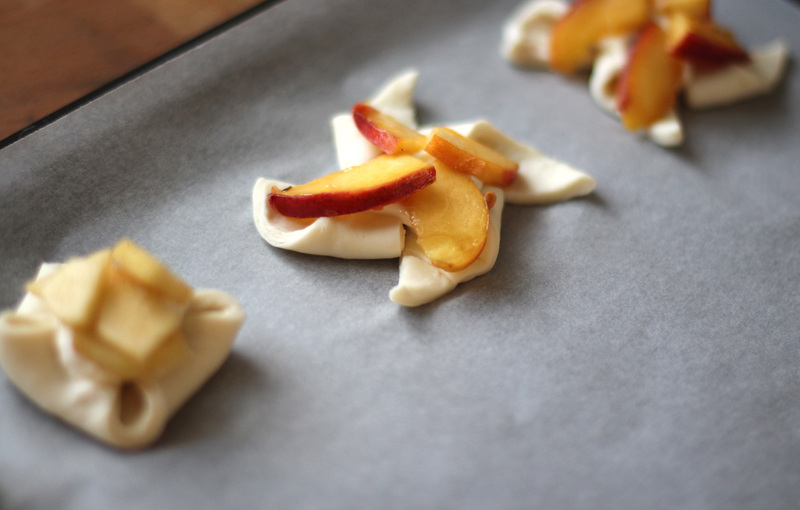 Put the curd cheese – yoghurt mixture on it and top it off with the apples or peaches. Then put it in the oven and bake it for the required time. If you want to you can coat the pastry with an egg/milk mix before you bake it as well.